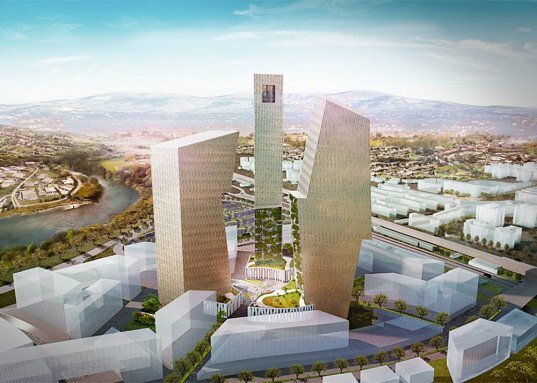 New York-based architect Daniel Libeskind has unveiled his design for the three towers planned for the 2470-acre site formerly home to Rome’s hippodrome. The three buildings stand in close volumetric relationship and are part of a larger master plan which will include the 52,500-seat AS Roma football stadium, training facilities, office spaces, retail, dining and cinemas. The tallest of the structures reaches 721 feet (220 meters) in height. 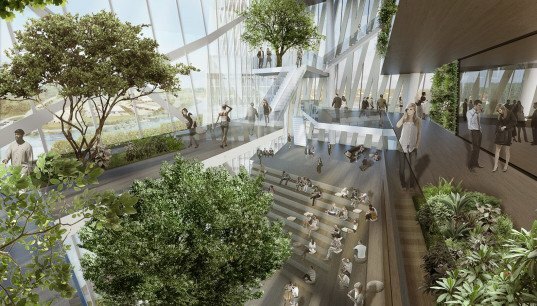 The towers emerge from a three-story podium with a planted green roof. The 3,000 sq-meter colonnaded public piazza surrounding the base provides amenities such as cafes and shopping areas. Rising from the base are the three structures that look like they’ve been carved from a single block of material, functioning both as separate elements and parts of a whole. The towers are clad in opaque panels and glass that create a pattern which breaks up their monolithic appearance and provides an aesthetic continuity between the structures. Large garden zones with multi-level open spaces for work, recreation and events are part of each tower and include full-grown trees and atria which provide unobstructed views of the city. 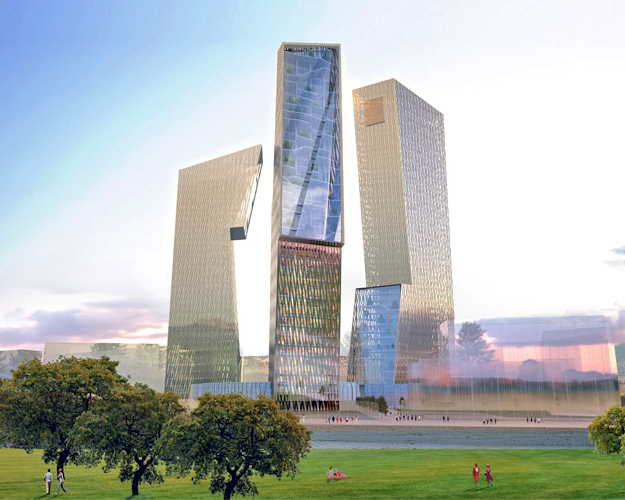 Functioning as the centerpiece of the composition, Tower One features more green spaces on opposite sides and provides efficient layouts organized around a central core. The towers emerge from a three-story podium with a planted green roof. The 3,000 sq-meter colonnaded public piazza surrounding the base provides amenities such as cafes and shopping areas. Rising from the base are the three structures that look like they've been carved from a single block of material, functioning both as separate elements and parts of a whole. The towers are clad in opaque panels and glass that create a pattern which breaks up their monolithic appearance and provides an aesthetic continuity between the structures. Large garden zones with multi-level open spaces for work, recreation and events are part of each tower and include full-grown trees and atria which provide unobstructed views of the city. Functioning as the centerpiece of the composition, Tower One features more green spaces on opposite sides and provides efficient layouts organized around a central core.